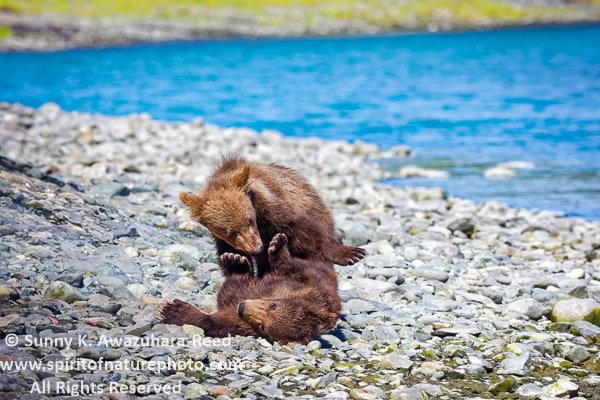 Continued from a previous posting...more images from McNeil River Sanctuary, the highest concentration of brown bears in Alaska. 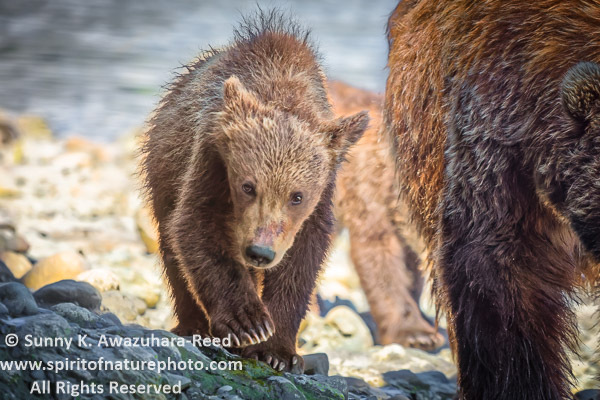 I’ve been posting these large dominant bears fishing and feeding at McNeil River Falls for the last few posts, now it's time to focus on bear families – sows with young cubs. McNeil Falls is a premium fishing place for dominant males. 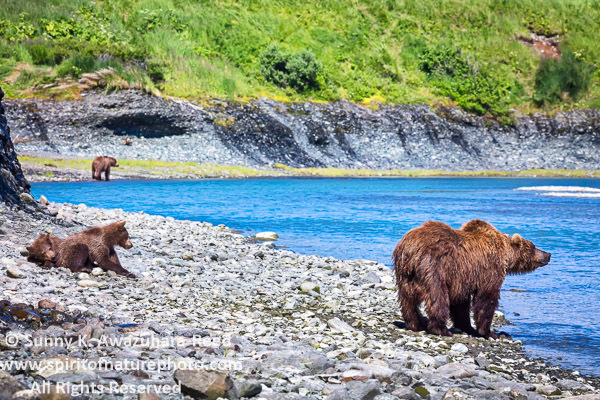 Many sows with cubs tend to hang out at the lagoon away from large males where the McNeil River flows into the ocean. The Chum Salmon steadily swim up the current through the lagoon towards the spawning grounds. 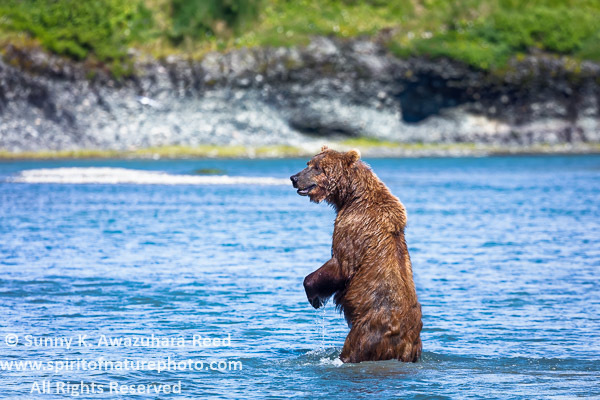 During one of the days at the Sanctuary, a group of us were led by a guide and we waded across the creek. We walked along a narrow rocky shore under the cliff along the lagoon while the tide was low and hiked through the grassy hills to the falls. 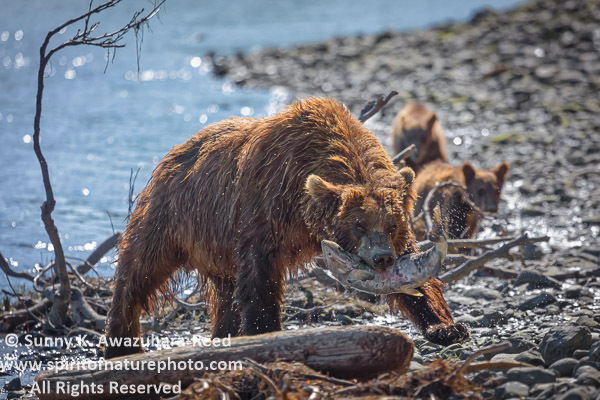 During the peak season of the salmon run, more than two dozen bears including multiple families spread across the lagoon to feast on their share of salmon. 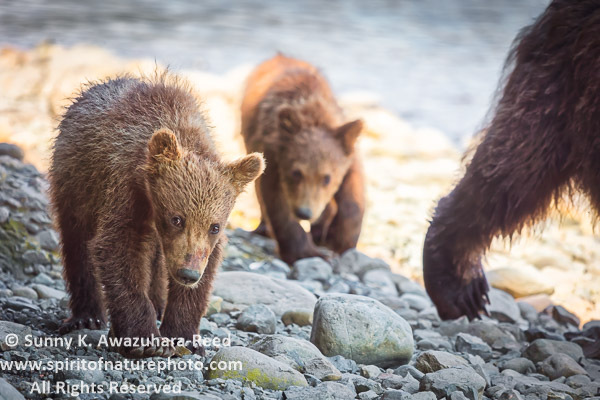 Those families with young cubs often stay at the narrow shoreline under the cliff – that’s the only pathway to the falls where we were hiked each day. 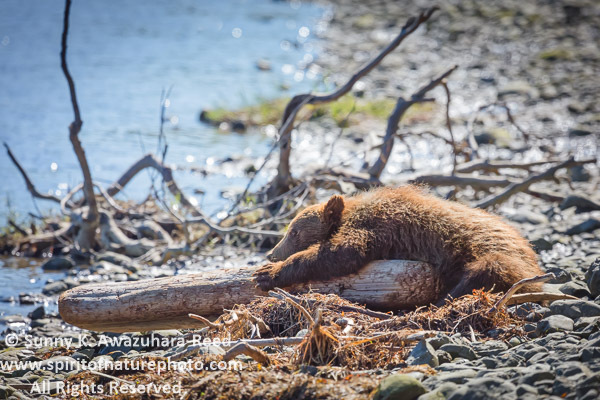 While mother bear fished for salmon in the shallow lagoon waters, the cubs curiously checked out the surroundings… playing, wrestling, and falling asleep in the sun. 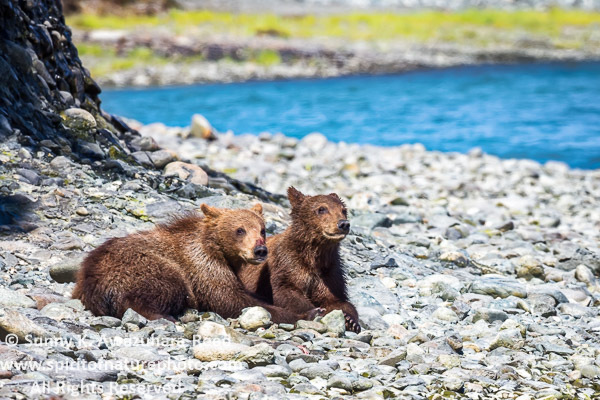 As we were slowly walking under the cliff, a bear family was nearby and we hoped the family would move away. 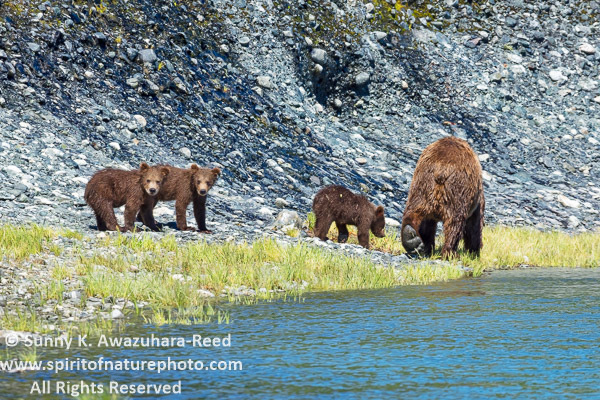 Another bear family with three spring cubs walked toward the family that we were watching. 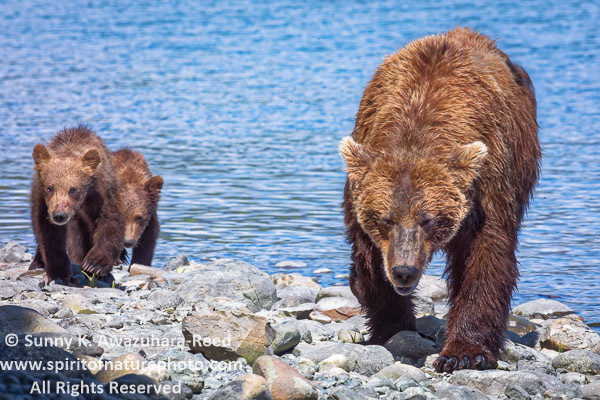 It made the mother bear nervous, so she turned around and headed in our direction followed by two cubs! Another family is leaving in a different direction. All this excitement happened on our first day as we headed to the falls. 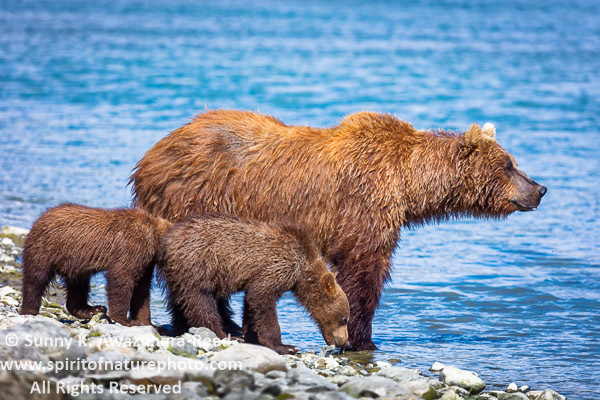 We saw the same bear family another day while traversing. 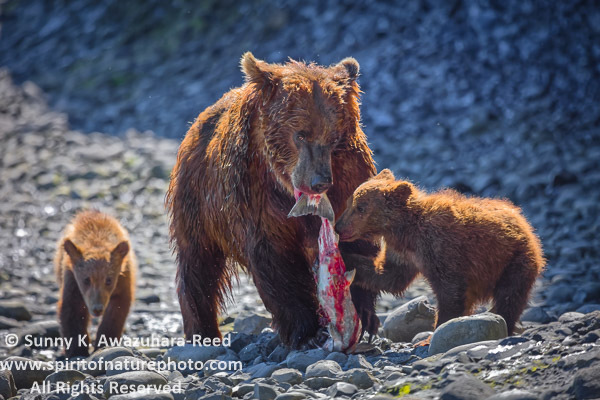 The mother bear caught a fish while the cubs gathered around for the feast. They finished a whole salmon in just a few minutes. As mother bear went back to the water for more fish, the cubs’ playtime resumed. 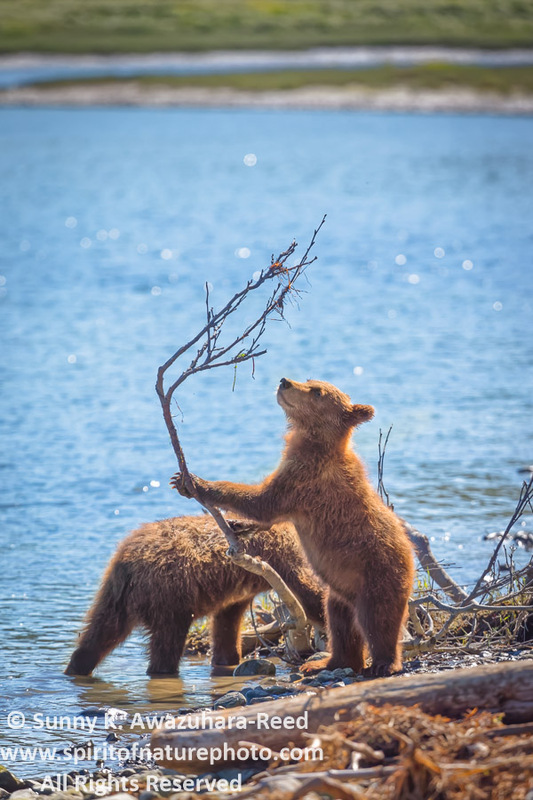 Under the harsh midday sun, the back lighting was a photographer’s nightmare. 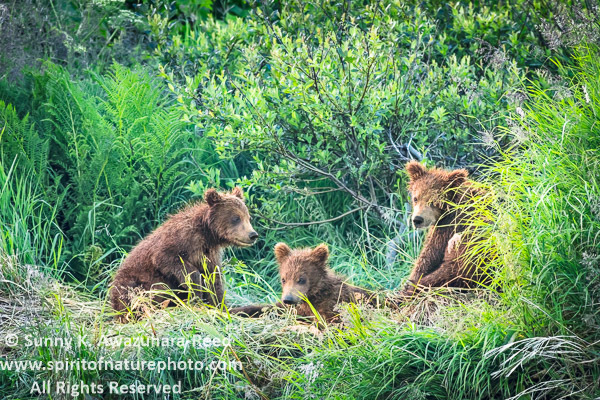 Here are another family with three small cubs playing in the grass. 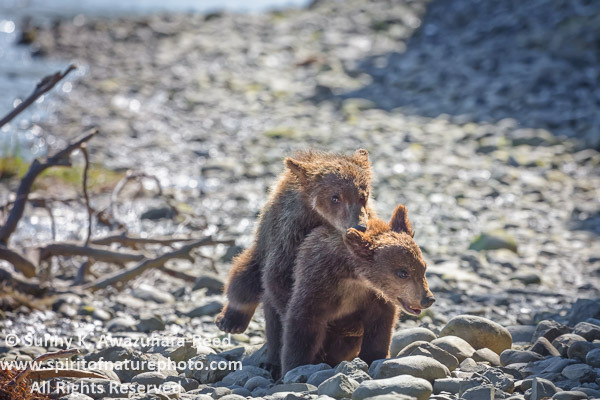 Large bear action in the falls are always interesting, but I personally enjoy observing and photographing the sows with cubs. 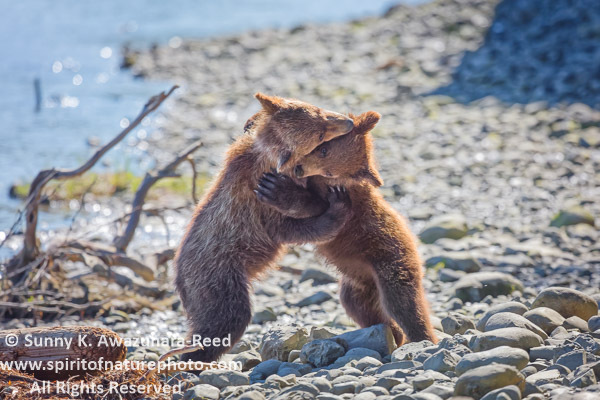 I’ll update with more images from McNeil River Sanctuary on my next blog posting. Please check back in a few weeks!